A Christmas Carol (with b&w illustrations by John Leech) by English author Charles Dickens, is about a miserly, cold-hearted Ebenezer Scrooge and his holiday conversion and redemption after being visited by four ghosts on Christmas Eve. This paperback book is a reprint of the original book which was first published on 19 December 1843 with illustrations by John Leech. 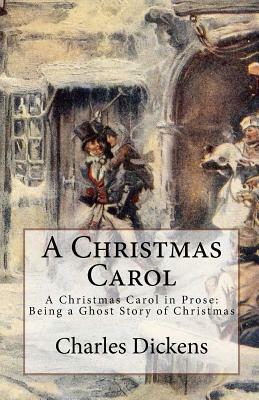 The principal forces that shaped A Christmas Carol were the profoundly humiliating experiences of the author's childhood, his sympathy during the decades of the 1830s and 1840s with the poor, especially children, and Washington Irving's stories of the traditional old English Christmas. While there are other authors before Dickens who celebrated the season, it was Dickens who imposed his secular vision of the holiday upon the public.